Early one morning last week this was in my yard. Then yesterday morning, this greeted me. 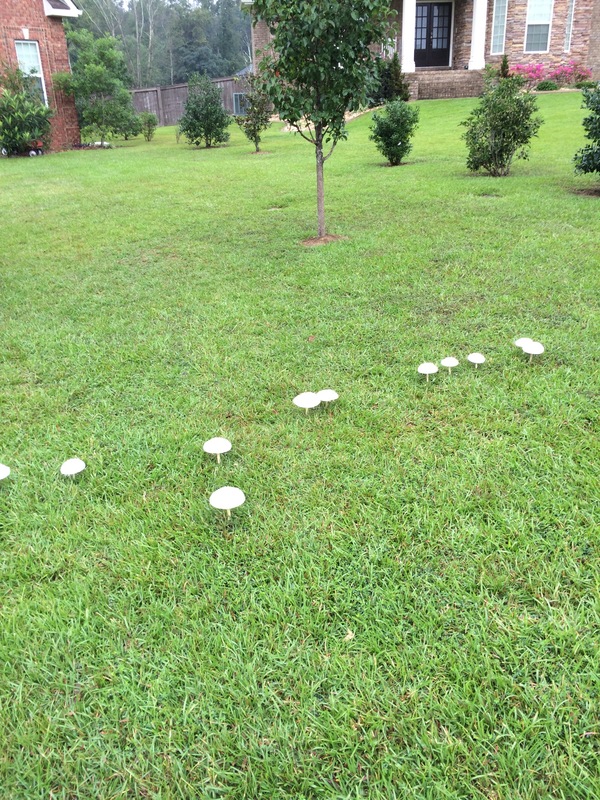 As one friend shared about her yard, it looked like the Smurfs had moved in overnight. I don’t know why, but I’ve been intrigued by them. On my walk with Miss Sophie this morning I saw the tiniest little ones, barely discernible to my bifocaled eyes. Where do they come from? What brings them to the exact spot that they grow and not to any of the other 1000 places in my yard? And why did they choose my yard over my neighbors’ yards? I’ve gotta tell ya, it feels pretty magical. I went to bed one night, no mushrooms. I get up the next day and that right there. Magic. Of the fairies sort. Or a test run for Santa and this is what he left. All silliness aside, I’m in awe of these creatures. 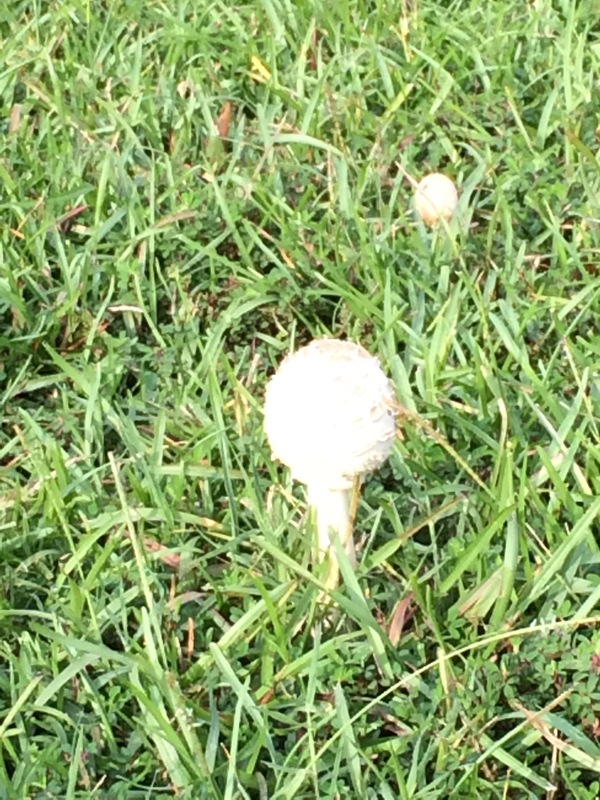 I do not want a mushroom anywhere near my kitchen and especially not on my plate, but in my yard…..downright delightful. How do they know how to grow? I mean, in that perfect circle like that. How is it that they do it–every. single. time. There’s one in the backyard that my bifocaled eyes first thought was a rock. It’s brown in color and HUGE. The top is very full and “fluffy” looking. It is going downhill slowly. I wonder what the lifespan is on a mushroom. I’ve never really had the chance to figure it out before because something or someone usually gets to any that we’ve had before they could reach their natural demise. 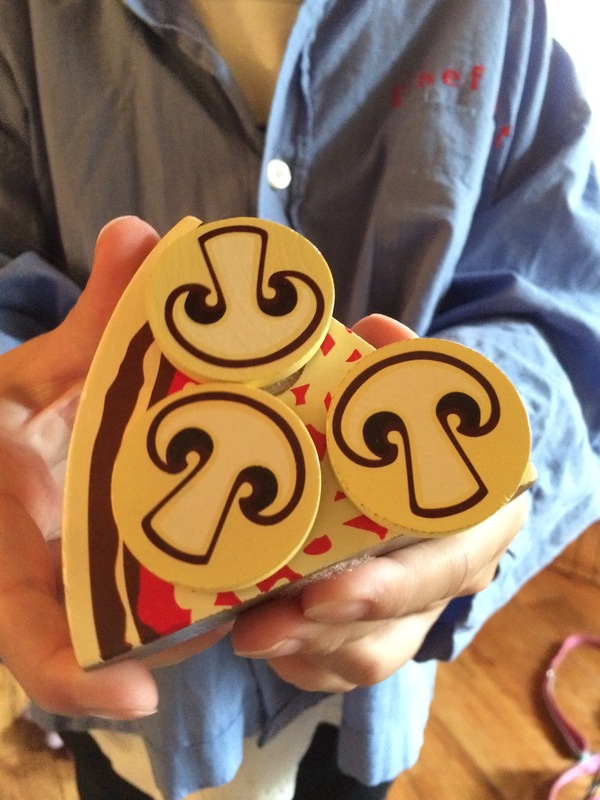 That round perfection…..of each and every mushroom in my yard. The exact placement of each one. That the One who created me took the time to place each one and taught it how it was supposed to grow, each and every one, in its perfect way…..that blows me out of the water. Mind blown. I guess this is where I should say something about grand design and how we are each created to grow and be just as we are…..in our own individual form of perfection. But I won’t. Instead I’ll say what I say when I see a perfect sunset or a field full of wildflowers or listen to the birds singing in my backyard (I’m a bird farmer, you know)….. I don’t want to eat one, but tonight I’m thankful for mushrooms. All of them sprinkled across my yard. For reminding me of the One who creates and for Whom our world and our hearts are palettes. Such beauty even in the midst of fungus…..sometimes I really like how God rolls.